Inca Religion - HISTORY'S HISTORIESYou are history. We are the future. Review: What were the most important crops in the Inca empire? What role did religion play in the daily life of the Inca? As with so many other ancient cultures, religion for the Inca was inseparable from their history, their politics, and their society in general. Religion played a large part in their everyday life. From marriages to seasonal success on the farm, from how the government was organized to how a person was buried, all areas of Inca life were closely connected to their religious beliefs. ​Successes and failures of all kinds happened because of the influence of the gods and the ancestors of the Inca. Because the gods could show their anger by causing natural disasters such as droughts or earthquakes, keeping the gods happy was an important part of Inca religion. Inca religion was also one way that the ruling elite justified their own privileged position within Inca society. Remember, too, that the Inca people were taught that the Sapa Inca was related to the sun god, Inti. Because of that, Inca religion was an effective way to spread the belief that the Sapa Inca was superior to his many subjects and had a divine right to rule them. When the leader of the government is a religious figure, that is called a theocracy. As you learned in your last lesson on Inca Daily Life, the Inca people worked hard. Life for the Inca people, however, was not all work. Just as with other ancient peoples you've studied, the Inca were polytheistic. That means that they believed in and worshiped many, many gods and goddesses. One important part of their religious worship was their many religious festivals. Some festivals continued for days. At the major festivals, there was singing, drinking, dancing, and eating. The Incas were deeply religious. The joy they experienced at festival time was not just a relief from their daily work, it was part of their religion. Brainbox: Why was Inti, the sun god, the Inca people's most important god? Gods and Goddesses: The Inca believed that their gods occupied three different realms: 1) the sky or Hanan Pacha, 2) the inner earth or Uku Pacha, and 3) the outer earth or Cay Pacha. Inti, the Inca sun god. The Inca Empire had an official religion. When the Inca conquered new territories, they taught this religion to the conquered peoples. As long as the conquered peoples agreed that the Inca gods were superior to their own, the Inca allowed them to continue to worship their gods. As a result, the many groups of people who made up the empire worshiped many different gods. The Inca worshiped the gods of nature. They believed that there was a god for every aspect of the Earth such as the sun, the moon, wind, lightning, and rain. The sun god, Inti, was one of their most powerful gods. Living high in the Andes mountains kept the Inca people close to their most important god. And, of course, because most Inca lived in farming communities, sunshine touched their very survival. The hitching post of the sun at Machu Picchu. The sun was so important to the Inca that they devised rituals to both honor it and to keep it close. As the sun set earlier each day in the winter, priests at Machu Picchu performed a ceremony to tie down the sun and keep it from disappearing completely. The Inca believed their kings were related to the sun god. As a result, the Inca thought their kings never really died. In fact, priests brought mummies of former kings to many ceremonies. People gave these royal mummies food and gifts. Some Inca rulers even asked them for advice. While the sun god was most important, the Inca also worshiped the gods of thunder, the moon, rainbows, stars, planets, and many, many more. Each of the many mountaintops in the Andes was a god. Like the ancient Greeks, the Inca believed the gods could intervene to help you or hinder you. Brainbox: Why do you thing that the Inca allowed conquered tribes to continue to worship their own gods? Inti - Inti was the most important of the gods to the Inca. He was the god of the sun. The emperor, or Inca Sapa, was said to be a descendent of Inti. The well-being of the king and the Inca Empire and the guarantee of a good harvest were entirely in the hands of Inti. The god was served by a dedicated High Priest (Villaq Umu), the most senior religious figure in the Inca world. Each major Inca town had a temple to the god and a vast amount of resources were dedicated to him. Even land and herds were reserved especially for Inti and a whole province near Lake Titicaca was set aside for him. The temple to Inti that was built in Cuzco, the capital of the Inca empire, included a corn field complete with life-size llamas and shepherds, all made out of pure gold. Inti was married to the Goddess of the Moon, Mama Quilla. Pachamama - Pachamama was the goddess of Earth or "Mother Earth." She was responsible for farming and the harvest. Viracocha - Viracocha was the first god. It was Viracocha who created the Earth, the sky, the other gods, and humans. Supay - Supay was the god of death and ruler of the Inca underworld called the Uku Pacha. It's true, the Inca built temples to their gods and worshiped their gods at those temples. Outside of the temples, however, all the world was a deeply spiritual place. For the Inca people, the world was filled with sacred places and objects. The Inca called these sacred places and objects huacas. Places were sometimes modified to accentuate unusual features and were treated as shrines with special power to influence reality. In the case of stones, they were sometimes taken for safe-keeping in palaces and tombs. On occasion, they could even be transported on military expeditions. The Inca prayed and left offerings at huacas, especially sea shells, textiles, coca, precious goods, and clay figurines. Believing that huacas were inhabited by spirits that could help them, the Inca also offered sacrifices to their huacas. Usually, sacrifices were llamas and guinea pigs. Some of the most sacred huacas in the Inca Empire were the resting places for the mummies of the dead emperors. Huacas could be people, places, or things. As part of religious worship, ceremonies were held, prayers made, and offerings given in temples, at sacred sites, and while holding sacred objects. Priests conducted such ceremonies. It was the job of the priests to make sure that the gods were satisfied. A priest's status depended on the god they served. To satisfy the gods the Inca did occasionally sacrifice animals, especially llamas. White llamas were sacrificed to Inti, brown ones to Viracocha, and dappled ones to Illapu, the weather god. Rarer, humans, including children, were sometimes sacrificed, as well. In a ceremony called Capacocha, Inca children would be chosen from provinces throughout the empire. A year prior to their sacrifice, the children would be trained for their role in the sacred ceremony. These more dramatic sacrifices were usually reserved for only the most dire times, such as periods of prolonged droughts, solar eclipses, or a royal death. What are 5 ways the Inca worshiped their gods? Rituals & Religious festivals: The Inca had numerous rituals and religious festivals associated with pleasing the gods and with worship. Items to be used in the afterlife were left with the sacrificed children. Cannibalism: Cannibalism is the act of one human eating another. The Inca did practice cannibalism, but their cannibalism was always related to religion, to ritual, and to sacrifice. Human sacrifices sometimes occurred after victories in war and were offered in many of the high mountain sacred shrines which dotted the empire. After a victory, a brave, opposing warrior might be sacrificed so that the Sapa Inca could eat his flesh. They believed that by eating a worthy adversary you would inherit their power, skills and accomplishments. More commonly, the bones of a sacrificed warrior would be ground up and mixed into a drink. The Inca believed that in doing so the Sapa Inca gained the strength of his opponents. Of course, it also showed the newly conquered people who was in charge. The Piercing of Ears: This was a male initiation ritual that took place during Capac Raymi, a festival that honored the sun god, Inti. During this rite of passage, boys had their ears pierced and large golden spools were inserted into the piercing. Boys were also given their first sets of "adult" clothing and were asked to perform ritual tasks at mountaintops surrounding Cuzco. The piercing of ears ritual was reserved for the elite and, once passed, the wearing of ear plugs was a mark of one's social status. ​The Combing of the Hair: This was the coming of age ceremony for young girls. Priestesses would perform this ceremony. During the ceremony, a girl would celebrate her coming of age by choosing a new name for herself. Girls would be sent to Cuzco where the ceremony would be held and the girls would either become brides or princesses of rulers. Only the most beautiful girls would be chosen for this ritual. Every month, the Inca held a major religious festival. Festivals were held outside. Games, songs, dancing, food, parades, and sacrifice (usually of animals) were all part of the festivities. If something special was happening, like the crowning of a new emperor or a drought, the Incas would include human sacrifice as part of the festival. Capac Raymi: This is one of the most important ceremonies in the Inca Religion. It occurred during December, the first month of the Inca calendar. This festival honored the Sun God Inti when he was at his most powerful. During the festival, participants sang, danced, feasted, chewed coca, and sacrificed animals. As an offering to their maker, Viracocha, on the day of the summer solstice, ashes of the sacrifices were gathered and thrown to the rivers in order to be taken out to sea. Inti Raymi: This festival was one of the most important for the Inca. It took place during the winter solstice (June) and lasted for 8-9 days. It was another ceremony where the Sun God Inti was worshiped. This ceremony was in winter because it was the time when the sun was the farthest from the earth. 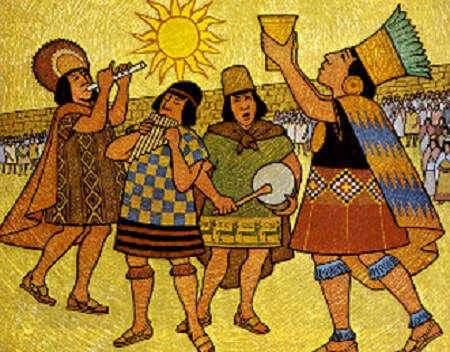 Due to the fear of famine, the Inca would fast for days and would plead for the sun to return. A white llama was sacrificed during this ceremony and a high priest would hold the heart up to the sun to ensure the fertility of the Earth. The festival concluded with singing, dancing, and lavish feasts. The conclusion of the festival marked the beginning of the plowing season. Capacocha: In many ways, Capacocha was the most sacred of the sacrificial ceremonies that took place in Inca society. This important ceremony honored both Inti and Viracocha. During Capacocha, all the towns across the empire were expected to send one or two good-looking children to be sacrificed at the ceremony in Cuzco. Sometimes, the children were buried alive. Usually, however, death was by either strangulation or having their hearts removed. This practice served two purposes. 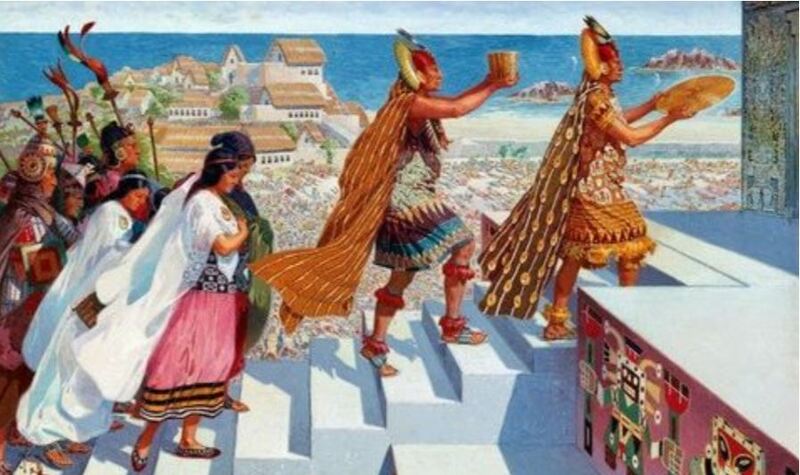 First, because the Inca took children from all over the empire, it renewed the bond between the capital and the provinces. It also confirmed the the power of the Sapa Inca as the son of the Sun. In other words, it honored the Sapa Inca as a god. It was believed that making this offering guaranteed the continued well-being of the ruler and his people. How did the Inca communicate with their ancestors? ​The Inca believed that gods as well as their dead ancestors could communicate with them through dreams, omens, and other signs. The priests were very powerful because people believed they could read the signs. Priests saw signs everywhere. They could read signs in the flames of a fire or in the way a plant grew. Afterlife, Ancestor Worship, and Mummies: The Inca believed in an afterlife. They mummified their dead. Priests held ceremonies. The family held a funeral for eight days. Women in mourning wore black clothes for about a year. They also cut their hair really short. The bodies and tombs of the dead were carefully tended. ​How was mummification different for the elite and for common Inca? The bodies of important community members were mummified in a process that included alcohol to speed the process of dehydration. Once bodily fluids were removed, they were wrapped in textiles and bound with cords. In order to prepare the mummy for rebirth into their next life, Inca mummies were bound in a fetal position. The mummies were then placed in tombs, in special rooms in a community burial chamber, or placed in sacred caves. Burial was not usually permanent, however. Inca families often brought the mummies of family members out of their tombs so that the mummies could take part in important community events such as marriages and harvests. Inca mummies either had useful items placed near them or they had the items bundled with the body. It wasn't just the elite who mummified their dead. Due to the climate high in the Andes, common people simply set the dead body out in the cold in above-ground tombs. The Inca could enter and reenter these tombs, leaving gifts of food and belongings. They could also retrieve the gifts if needed. Funerals were very sacred events for the Incas. They believed that people were sent to live in heaven or hell after their death. Important people like Emperors and Priests were buried in above ground chambers, while commoners were buried in pits, caves and other types of graves. The Incas also believed in reincarnation. The people who obeyed the Inca rule of ‘ama sua, ama lulla, ama chella’ (do not steal, do not lie, do not be lazy) were sent to live in the Sun’s warmth. Those who did not live by this rule spent their afterlife in the cold, dark earth. Tomb of an Inca elite. Older generations were never forgotten in Inca society. The Inca mummified their deceased and the mummies would be presented with objects which were to be taken along with them to their final resting place which was known as the Pacarina. Tombs were also re-opened from time to time so that people could make new offerings to the deceased. These took the form of precious goods and food. Upon reaching the Pacarina, the mummies would be able to mingle with the ancient ancestors that were also buried there. The mummies were used in many rituals and celebrations and were buried in a sitting position. Particularly important individuals who had passed away could be represented in the community by statues. A statue of the founder of the community was often the most precious object in a community. Inca leaders sometimes exploited this tradition and "kidnapped" the idols of conquered communities. It was believed that keeping the idols hostage at Cuzco would help ensure the obedience of the vanquished. Brainbox: Why did the Inca mummify their dead?